Incase Designs is turning heads with the hippest new case for your PDA. Interior pockets for those business essentials, high-performance materials and a zipper closure for security--all in a portable design slim enough to fit in your pocket. This case will hold the most popular PDAs and Windows CE compatible palmtops, including 3Com PalmPilot III, Personal, Pro, PalmPilot 1000, 5000; Casio Cassiopeia E-10; Everex Freestyle; IBM WorkPad; and Sharp SE 300.
i did some hacking to attach the cover for my visor via veclro so it wasn't on the unit, write me if you want advice, this is a GREAT case. i've dropped it SEVERAL times and NO DAMAGE! Sometimes as far as 5 feet, works like a charm! This is a neat case. Too bad my Cassiopeia E-105 doesn't fit it. I even tried stretching the case around my Casio, still couldn't make it fit. I got this case as a gift from a friend. I love this case- especially in red - my favorite color! Simple design and a nice soft material. I'm using it everyday and it holds up really well. I got rid of my wallet since this case fits my money and creditcards too! Ugh! Get the black case! Pack everything you need, except the kitchen sink. Incase Designs is proud to introduce its new handheld (HPC) computer case that doesn't compromise on function, portability, or design. 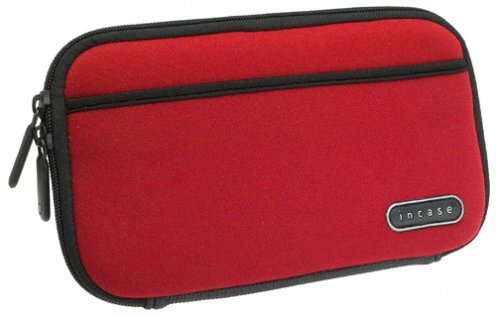 This case is soft and squishy and is built with protective materials that are ingeniously designed to keep your computer as snug as a bug in a rug. I have had this case for about a year now, and have thoroughly enjoyed it. It has protected my Palm IIIx from at least two drops that might have resulted in permanent damage. It is quite snug, but I am able to carry my driver's license and two credit cards in it. I use it as my wallet in most cases, but if you need room for more cards or money, you might want to get a bigger case. And, as another reviewer said, it would be nice if there was at least a wrist strap to hold onto. When fully loaded the unit is kind of "fat" for lack of a better term. The velcro that holds the unit in is adequate but not as tenacious in it's grip as some I have seen in other cases. This is actually good, as I normally take the unit out to HotSync. If you use a HotSync cable, however, you would not even need to remove the unit. Just lift the bottom of the unit slightly, attach the cable and perform the sync. Very handy. The neoprene holds up pretty well, although it is somewhat prone to picks if tossed in and out of briefcases or coat pockets, or dragged across rough surfaces. Nothing that causes permanent damage, however. I have a palm IIIe in it and the fit is VERY tight. In order to close it I have to scoot the stylus over to the side of the pda and then I can barely zip it closed. Not enough room left over to even think about putting anything else in it. It also doesn't have as much protection as I had hoped, the sides are floppy and the neoprene is not all that thick. Overall, I'm very disappointed. This case really only fits devices that are the same size as Palm Pilots. Palm devices that are slightly larger - like my Uniden - just don't fit. It is a very nice case, I just wish it fit or that the size was actually listed on the advertisment and I didn't have to cross my fingers until it got here - so much for crossing my fingers. Although I find the case useful, the velcro provided gets in the way. In order to secure my Jornada in the case, I had to attach the velcro circles. Now it stays still in the case, but the velcro causes problems with the docking station. I've had to remove the velcro just to sync the Jornada. I actually got this case for my Sharp Zaurus I-Cruise (a color PDA from Japan). I looked around the web quite a bit, and this was the only one that I could find whose design I liked and that fit the dimensions of the Zaurus. (I had trouble finding out what the exact dimensions of the inside of the case were to be sure that it fit my PDA -- just for your information, the inside of the case measures 20cm wide by 11.5 deep. The outside of the case is about 2cm bigger each way). It is made of a nice black nylopn material that has a good feel to it, and there is about 2mm of gel-like padding under it, and it looks like it would provide decent protection against a moderate fall (I actually did drop my PDA a couple of feet to the concrete while in the case, with no adverse results). The bottom has a textured rubber coating on it. It feels good in your hand and looks good too. I also like the "incase" logo on the lower right-hand side. There is a pocket on the outside of the case that is held closed by elastic around the rim. I wouldn't put anything very important or heavy here, however, as it seems like it would fall out. I like the fact that the zipper-pulls are large and easy to grasp, but I was a little disappointed that they were made out of plastic and not metal. In general, though, it seems very well put together, using high-quality materials and workmanship, and I think it was worth the $30 I paid for it. The inside is made of a soft material. There are four elastic bands on the inside -- two at the top are apparently made to hold pens, and the others are apparently for extra AA batteries. I wonder about the wisdom of actually placing pens in the holders, though, since it seems that they would rub up against the PDA when the case was closed. There are also four pockets inside that look like they are intended for credit cards or business cards, and there are two larger pockets (one made out of a see-though mesh) that could be used for PC-Cards and the like. The fit is tight enough to keep the cards from falling out. I probably would have preferred that they include more of these pockets instead of the other kind, since I don't plan to keep credit or business cards in my PDA case. The case comes with two strips of velcro tape that you attach to your machine, and these attach to the velcro on the bottom of the case, keeping the PDA from falling out. I wondered at first about putting velcro on my PDA, but it has worked well (luckily, the side that you attach to your PDA is the soft side, and not the prickly one, so it doesn't feel bad when you are holding the PDA outside of the case). After using the case for over a month, I think that it is a nice size and fits in the hand well. Unfortunately, I have started to notice that the material on the outside (especially around the rim of the outside pocket) has begun to wear away slightly, with some of the threads sticking out. I have also noticed that the material tends to attract dust and hairs fairly easily. 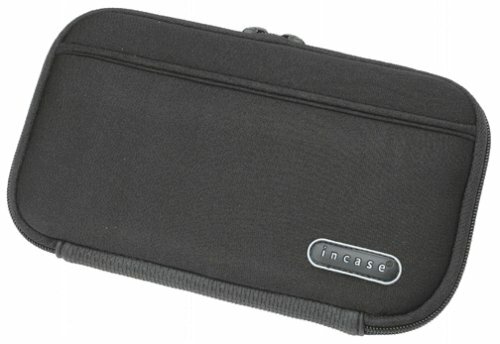 Incase Designs presents an attractive soft case for your PDA. The PDAPouch provides a protective padded interior, shock-absorbing neoprene exterior,and a no-fuss belt buckle--all in a light, portable design that's also elegant.It also features a super D ring at the top for easy carrying. I got my order (Incase Designs PDA Pouch). Very decrepit looking. What nerve to sell something in that kind of (poor) condition. It is never a good idea to be so dishonest because it will always come back to you in the end. Just received this and it looks old. All around the edges the rubber is pealing off the flexible fabric. In addition, it is too tight, not deep or wide enough to fit my Jornada 520. No slot for stylus. Top flap barely covers the PDA to reach the velcro. Not enough protection for the PDA if dropped. The belt quick disconnect is the only good feature of this pouch. I'm using an old Nintendo game boy case and have yet to find a better hip pouch. This is the risk of buying without seeing the product first. If Amazon was local, I'd return this pouch. HORRIBLE! RIPPED FIRST DAY OF USE! This case is HORRIBLE! The rubber around it ripped the first day of use! Buy the more expensive case from Palm or Handspring! The perfect protection for my Hi-Tech toy! This case is great! It hugs the body so my mini-disc isn't jarred around when I move and it protects it from the elements. I don't know about anybody else but after spending over $200 for my mini-disc, spending another $20 is well worth it to keep my investment secure. I received an MD recorder as a gift so that I could record my own music to take to the gym and stop being subjected to the whims of the receptionist's musical tastes (or lack thereof). The neoprene pack is great to take to the gym. You can either wear it when moving amongst the weight equipment or hang it on a cardiovascular machine. Sure, a fanny pack would probably do the same job, but the small compartment for the player keeps it from bouncing around inside the case. The compartment stretches enough to easily hold three MDs. The only down side of this case is the smaller zippered compartment. The stick remote for the MD player barely fits in there and anyone who uses the headset that came with the MD player wouldn't have a place to put it. Sporty ear-buds fit in there nicely, even with the stick remote and a couple of spare batteries. Knowing how delicate Palms are, I bought this for my new IIIxe. The leather belt clip types just don't offer ANY drop protection and I thought this thing would. Boy was I wrong! Dropped it less than 2 feet and discovered the corners aren't protected at all, now I'm looking at a $100 screen replacement. I'm throwing this thing away and buying rhinoskin. I've broken 2 screens on my Palm III and I think I've finally found the answer in the Incase Palm Top Case. The covering really protects while not looking like something that would survive a nuclear attack. The blue color is great. I believe that torque is the issue with me when it comes to my broken screens. This case offers much more protection than my fancy expensive leather wallet type case. It could use a bit more storage space for cards and such. Overall, I'm very pleased and would highly recommend this item. When I decided to buy a Cassiopeia E-105 from Amazon.com, this case popped up as an option. I ordered it, unfortunately, my Casio won't fit into this case at all. It's a great-looking case, so I was disappointed. Nice case for Handspring Visors, too! I was pleasantly surprised by the case, considering the low sale price. I was looking for a case to use as a wallet replacement, so I was very concerned about slimness. Although the dimensions (my estimates with an ol' fashioned ruler), 5.5 X 3.75 X 1 (a weebit thicker if stuffed with cards and cash) seemed large on paper, it fit quite nicely in the front trouser pocket (too bulky for shirt pocket, BTW). This is because, compared to a comparable "slim leather bifold case" I used before, the Incase has smooth, rounded edges, which makes it "feel" slimmer in the pocket. It's also very light; plus it doesn't have an exterior tab like most wallet-type cases, to snag on your pant-pockets when retrieving/replacing your case. Since it's an enclosed case, the alarm was only slightly muted, so I would set the alarms on the high setting. On the aesthetics side, it DOES feel and look slick. I like the color, deep navy "midnight" blue. It looks more rectangular, and less oval-shaped than the pix suggest. It also has reinforced edges on the inside, which protects it, and also provides a good grip while using the visor. Not to make this a dissertation, but the design also gives you easier access to cards and cash compared to the bifold design (IMHO). The styus holder is a nice touch, saving me the trouble of pulling it out of the visor each time. Overall, a very good value. The only minus is the use of velcro to secure the handheld in the case, but who cares! Don't tell anyone... ;-) So, if you're an obsessive-compulsive like me (if you own a palm-device, you probably are), and want all your things in one place, then this is a nice alternative to the traditional leather wallet cases. I have been using this case for my ipaq3150 for a few months now. Works great. It has good amount of foam padding and paper padding(?) so it feels rigid yet gives enough cushion. I have actually used 3 pockets inside of the case, but it's nice to have them just in case I receive a business card or something like that. One thing that I don't like is that It draws shadow on my ipaq when I put it inside the case it's sometimes hard to read what's on my ipaq especially indoors at night. This case slides smoothly into and out of your pocket. You can take it out, flip it open and it's ready to use right there like a Star Trek tricorder...or those old communicators from TOS...whatever! The case is very plushed up for your PDA's protection. You could probably drop it and your PDA won't break. WAIT! I'm just kidding. I don't know that and I have not tried it...Don't do it! Anyway, it is very plush and snug and it will protect your PDA to a certain degree. It'll prevent scratches...wait, let me rephrase that. Scratches will be at a minimum, dust will collect at a minimum, it'll resist water to a certain degree (I mean you can probably run through rain and the case could protect it, but if you take a swim with it...it's over). Unfortunately, it's not bulletproof. What more can I really say? A pouch is a pouch. This one works great. Oh, the bad sides to it... For some PDA's, you may have to kind of shift the PDA into the pouch like 1 centimeter to the left because it won't fold perfectly with the stylus on the right, top section of the pouch, meaning the stylus will fold onto the top of your PDA when you close it and it'll kind of bulge out...may not be such a great idea for the display screen, too. OH, I would advise people not to place any hard or sharp object into the pockets it provides because when you fold it shut, obviously it'll touch your PDA screen and...you may begin to cry. I'd recommend putting something like micro-fiber cloth, wipes, etc. into those pockets. Overall, this is a great case. It's nice in design, it's durable, and convenient to lug around. It's much better than the factory pouch my PDA came with. Basically, it does what it is designed to do, so how can I give it a bad rating? Unless, it had cheap meterial, cheap engineering...but this one...engineered well and tough material. I'd recommend it to anyone with an iPAQ. Hey, for now it's either that or the $40-"executive" leather case, which in my opinion, is simply a cover rather than a case. Of course, there are new cases coming out soon, but like I said, "for now." This case fits an IPAQ 3650 in a CF sleeve perfectly which is what it was bought for. It is a little too small for a Palm V on the Ministrel (Omnisky) model which I was hoping it would also fit. For the IPAQ, this case has lots of padding and stiffness over the screen area. The inside pouches should be eliminated because it is unlikely that you can use them without taking a chance on scratching the screen [the smaller size which fits a Palm V without the modem has the same problem]. The large case in a slicker graphite fabric looks better than the smaller neophrene ones. Highly recommended but could be improved by substituting a smooth lining and a nylon zipper so the case of the PDA is not "dinged" by the metal zipper as happened to my Palm V with the smaller case. Right after I bought my Palm IIIxe, I started looking at cases. I don't want to flash my PDA every time I need to get at my money, so I wasn't looking for a wallet replacement. I just wanted a decent-looking case that was protective, fast to open and close, and as compact as possible so that I could still carry it in the inside pocket of my coat. I was browsing through a travel store when this little case caught my eye. It fits my needs perfectly and is very subtley stylish -- you can't really tell it's a PDA case. For a good looking, compact, protective case, you can't beat this one.